I am thinking of sailing the February 3-24, 2019 Seabourn Quest 21-day Antarctica & Patagonia cruise. On the Seabourn website, it says Days 6-14 days at sea without an explanation. I just sent out a message to Seabourn to clarify this. I have a few questions: 1) How long does it take to get from the Falklands to Antarctica? 2) How long does it take to pass the Drake Passage while cruising the area? 3) Will we be able to land and actually set foot in Antarctica during the cruise? 4) Is there a possibility that we will not land the continent at all due to weather conditions? 5) How many landings do they do in Antarctica? 6) When they say zodiac cruising, does it involve a landing as well or just staying on the zodiac while looking around the continent? 7) How many days does the ship stay in Antarctica? Sorry, too many questions but this is not a cheap cruise so before I book, I want to make sure what to expect. Thank you. With the Antarctic 2018/2019 cruise season just around the corner, I thought it would be a good time to talk about Antarctica and clarify some of the mysteries surrounding Antarctica cruises. First, let me answer the questions from the reader mentioned above. Typically to get from the Falklands to the Antarctic Sound takes around 48 hours. On my upcoming Antarctic cruise on Silver Cloud, for example, we depart Stanley in the Falkland Islands on Wednesday, November 14, at 1 p.m. and arrive in the Antarctic Sound on Friday, November 16, at 3 p.m.
Will you actually step ashore in Antarctica? A regulation by the International Association of Antarctica Tour Operators and the Antarctic Treaty Parties stipulates that vessels carrying more than 500 passengers are not allowed to land passengers ashore while in Antarctic waters. 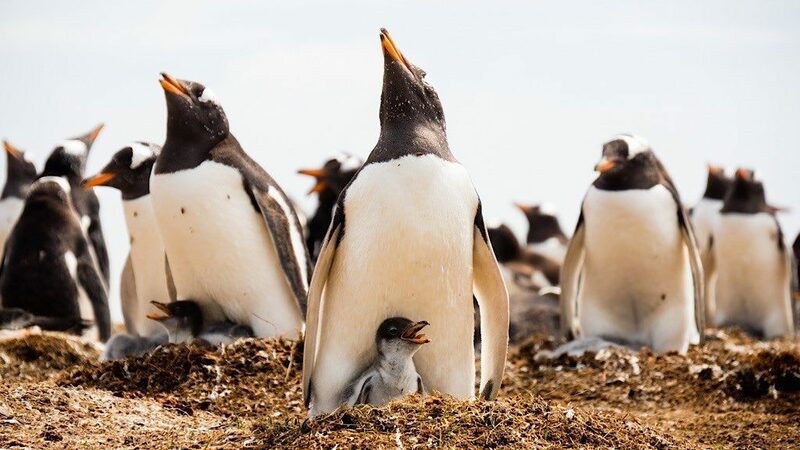 So while Holland America Line's 2020 Grand World Voyage features four days in Antarctica, you'll spend those four days on the 1,380-passenger Amsterdam, not on shore with penguins. In contrast, Holland America Line's sister company, Seabourn, can land its guests ashore on the 450-passenger Seabourn Quest. Will weather conditions prohibit your going ashore? Not likely. How many landings will you do via Zodiac? Generally, one to two each day that you are in Antarctica. What is Zodiac cruising? Usually, Zodiac cruising means sightseeing via the flat-bottom inflatable vessel, passing ice formations and zipping along the shoreline to view marine life. How many days does the ship stay in Antarctica? Typically four to six days. What many readers would also like to know is what’s included in their Antarctica cruises. Do you need to bring a parka? How about boots? Can I kayak? Camp ashore? Are excursions included? The “What’s Included” chart accompanying this post covers much of what is included on Antarctica expedition cruises that are 10-14 nights in length. Depending on the cruise company, the spectrum ranges from á la carte adventures to all-inclusive luxury. For cruises that are not all-inclusive, you can generally expect the fare to be lower, as indicated in the rates in the Antarctica Cruises: 2019 Per Diems chart, but the level of luxury may not suit some travelers. The duration of the cruise, 10-14 nights as opposed to 14 nights and longer, can also affect what's included, as can the stateroom choice. 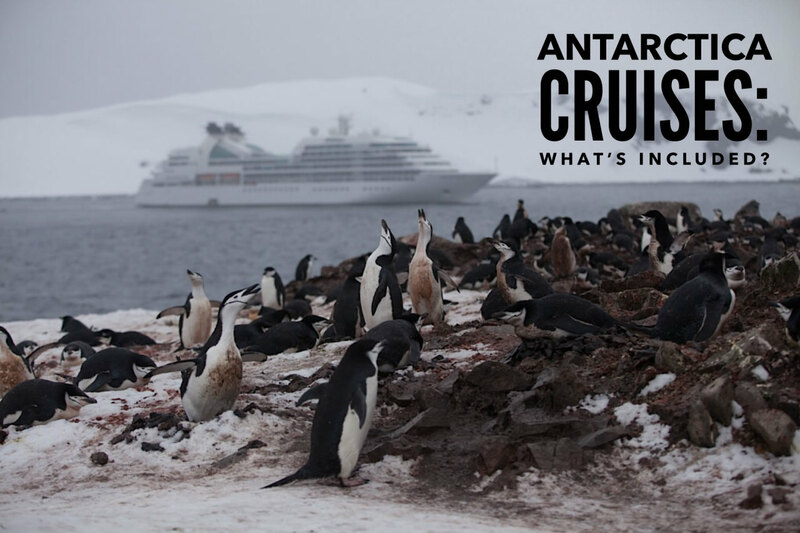 The "What's Included" chart attempts to distinguish cruise companies apart from one another, but there are other factors, such as onboard services, that may play a role in your decision as to which cruise company to choose for your Antarctica cruise. Scenic and Silversea include the most services at no extra cost: butlers, room service, alcohol, gratuities, kayaks, optional excursions, WiFi, parkas and in-suite mini-bar, restocked as needed, including alcoholic beverages. Other cruise lines will also include some of these services or provide them for a fee. Seabourn is equally as inclusive as Scenic and Silversea, but Seabourn does not offer 10- to 14-night cruises in Antarctica. The company does offer 21-day or longer Antarctica cruises that will be included in a forthcoming chart. Likewise, all-inclusive Crystal Cruises launches its expedition ship for Antarctica in 2020 and thus is not listed in our 2019 chart. Scenic offers optional excursions in a four-person submarine and a six-person helicopter. The rates for these optional excursions were not readily available on Scenic's website. If 6 star luxury is not a priority for you, Lindblad forgoes the butler and room service, but includes most everything else. Lindblad partners with National Geographic, and professional photographers accompany passengers on kayak excursions that are included in the fare. Ponant, on the other hand, includes all most of the luxuries, but charges for its new sea-kayaking adventures. Quark describes itself as an ecotourism company and partners with The Nature Conservancy for excursions. Quark offers adventures that include camping on the ice, kayaking, guided mountaineering and more. For pricing these adventures, you must phone Quark or a travel agent – or add these extras at the end of the online booking process. Oceanwide quotes $190 per person for its camping excursion with a guide and $465 per person for a kayaking package. Oceanwide also provides a diving adventure for an additional fee. Hurtigruten has one of the lowest per diem rates with take-home parka and loaner boots included, but the extras can add up. All else – gratuities, alcohol, minibar, kayaks, WiFi and some excursions are extras you can pay for as you choose. Hapag-Lloyd includes room service and minibar for certain room categories (namely, the pricier rooms). Hapag-Lloyd also charges for alcohol. Port charges and transfers from airports to the ship are included on all Antartica cruises featured in our What’s Included chart. Each cruise line seems to handle airfare differently, however, and there are differences as to how pre-cruise hotel nights are handled. With Quark, for example, you make your own way from the airport to the hotel, but the pre-night hotel is included in the rate. Silversea includes roundtrip coach airfare between the United States and Buenos Aires or Santiago, with reasonably priced business class upgrades; and domestic charter roundtrip flights between Buenos Aires or Santiago and either Ushuaia or Punta Arenas, plus transfers and a pre-cruise hotel. Silversea states that these inclusions represent a $2,000 value, which if factored in would drag down the per diem. Ponant and Hapag-Lloyd include domestic charter airfare within South America to get their guests between major airports like Santiago, Chile or Buenos Aires and Ushuaia or Punta Arenas. Lindblad includes airfare between major gateway cities in the United States and South America. Hurtigruten currently includes an overnight hotel stay in Buenos Aires before the cruise; as well as coach-class flights between Buenos Aires and Ushuaia. Other cruise lines such as Scenic, Oceanwide and Quark did not indicate included airfare and had no special offers at the time of comparison research. Quark requires you to book air/hotel packages through the company when you book one of Quark’s cruises. Some cruise lines also offer time limited early booking discounts. Double check the websites or check with your travel agent for special offers, incentives or packages. Note that there may be time limitations or extensions to special offers. The “What’s Included” chart reflects that most cruise lines include parkas either as a loaner or to take home. Oceanwide charges a $50 rental fee for parkas. The chart also indicates that all cruise lines include rubber boots as loaners, except for Silversea. Silversea suggests that you rent boots from Ship to Shore Traveler ($80 for rubber boot rental.) Rubber boots are required to land ashore in Antarctica. Silversea has loaner boots but cannot guarantee your size will be in stock. To be assured you’ll go ashore, rent your boots or buy them (I paid $110 for Bogs at Zappos.com). If you are having your rental boots delivered to the ship be sure to order them at least 30 days before departure. Some companies provide other loaner gear as well. Hapag-Lloyd includes one pair of binoculars and two sets of Nordic Walking poles cabins. Quark loans snowshoes. These are are just a few examples. Many cruise companies offer pre- and post-cruise excursions and hotel stays. Sometimes the cruise lines include these pre/post excursions as incentives. All of the companies on this chart include zodiac excursions on their cruises. Zodiacs are inflatable flat-bottomed crafts that take small groups between ship to shore. These excursions are commonly called “landings.” With Zodiacs, expedition cruises would not be possible. Lindblad takes an ROV submersible camera out on some zodiac excursions. ROV is a remotely operated underwater vehicle – essentially a tethered underwater mobile robot that can descend deeper than a scuba diver. The ROV is controlled from a mother vessel to take video and photographs. This allows you to view great depths in the cold ocean through the camera lens, while remaining comfortable and dry aboard the zodiac. As mentioned previously, Lindblad, Scenic and Silversea include kayak excursions in their rates. Hurtigruten, Oceanwide, Ponant and Quark offer kayak excursion packages for an extra fee. Lindblad and Silversea also include extra excursions. Lindblad includes a pre-cruise guided tour of Santiago. Lindblad’s website also mentions hiking excursions are included as well as "unplanned excursions." Scenic offers an additional excursion in a four-person submarine. The rates for the submarine and the ship's six-person helicopter excursion were not readily available on Scenic's website. Quark offers adventures including camping on ice, kayaking, guided mountaineering and more. Quark also provides a diving adventure for an additional fee. Quark advertises that it focuses on wellness. On the ship, you’ll find a salt-water pool, sauna and a smoothie bar. Pack a swimsuit. Quark also includes yoga and stretching classes. Oceanwide quotes $190 per person for camping excursion with a guide and $465 per person for a kayaking package. Oceanwide has a spa with Finnish sauna with an ocean view, steam sauna, indoor and outdoor relaxation area (spa treatments and hairdresser at a surcharge). Silversea includes air between the U.S. and South America, reasonably priced business class upgrades, transfers and a night in a pre-cruise luxury hotel. Silversea also has a spa, pool and wellness classes included – For an extra fee and extra luxury Silversea also offers premium cigars and cognac. Earlier this year, Silversea introduced its new My Photo Academy on sailings to Antarctica aboard Silver Cloud, using the ship’s new Photo Studio as a hub for the multifaceted enrichment program. New for Ponant are sea-kayak adventures and hiking excursions Ponant also features a Hammam (Turkish bath) on its ship. Included by all cruise lines on every voyage at no extra cost. Antarctica Expedition Cruises, What's Included? * Suggested gratuities for Hapag-Lloyd, Hurtigruten, Oceanwide and Quark are $10 per person per day. ** Some companies provide alcoholic beverages, such as wine and beer, at mealtimes, while others, such as Silversea and Scenic, provide 24/7 open-bar beverages. *** Not all ships have mini-bars, nor do all staterooms. And not all are restocked free of charge, but others are, depending on the category room. ^ Complimentary WiFi depends on room category on some ships. ^^ Most companies give guests parkas that they can use during the cruise and take home. Hapag-Lloyd loans parkas that must be returned while Oceanwide charges $50 per voyage for the use of parkas. #Not all excursions are included, such as kayaking on Hurtigruten, which runs from $199-$995 per person. * Though it has a passenger capacity of 970, Hurtigruten's Midnatsol Antarctica voyages carry only 500 guests in order to comply with the IAATO regulations. Similarly, Ponant's Le Soleal has a capacity of 264 but carries only 200 in Antarctica. Scenic Eclipse carries 228 guests but only 200 in Antarctica. ** Ponant has butlers for some staterooms but not for the lead-in accommodations in our chart. **** Pricing for Ponant's balconies were unavailable because the voyages were sold out. The post Antarctica Cruises 2019: What’s Included? appeared first on Avid Cruiser.